I've finally settled on a design for one of my Colonial Williamsburg pieces - a polonaise jacket, inspired by a couple of the fabulous jackets in the Imatex collection. What is a polonaise jacket? 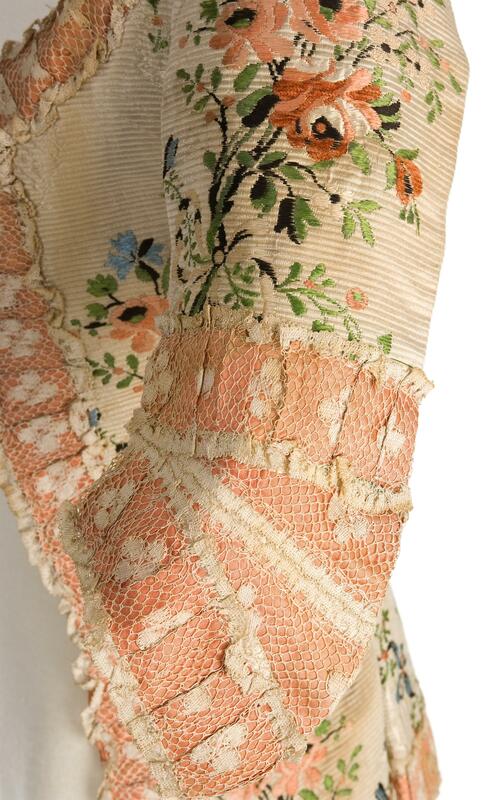 We're familiar with the term "polonaise" as a dress with the skirts draped up in three "sections," but 18th century polonaises had a more specific design. While you could wear your robe a l'anglaise a la polonaise, a robe a la polonaise was something different, a gown or a jacket cut like man's frock coat, with the front edges falling back and away from the chest, and the back bodice and skirt pieces cut in one, again, like man's coat. Imatex - polonaise jacket, 1770s or early 80s. This one does not meet at the center front at the top, but still falls away from the chest. The yellow jacket is more complex than the floral, in the number of seams and pleats. The floral is surprisingly simple, with only a center back and two side back seams, and no side seam at all. When worn, this jacket would have fallen open rather wide over the full skirts, whereas the yellow jacket is far more fitted through the waist. Imatex - polonaise jacket, 1770s or early 80s. You can see the back is quite simple, with a center back seam, and two side back seams that flare into inverted pleats. Imatex - polonaise jacket, 1770s. Much more complex, with multiple pleats in the side back seams, and side seams that also end in a large, single pleat. 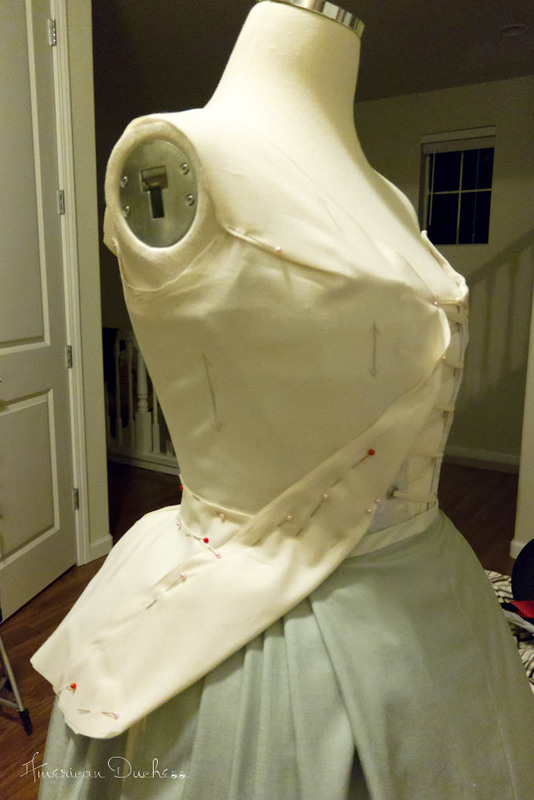 I thought I'd have a go at the simpler version, though I soon found out, in draping, that with the flare of skirts and how I preferred the jacket to fit through the waist, I needed to add that side seam in there. 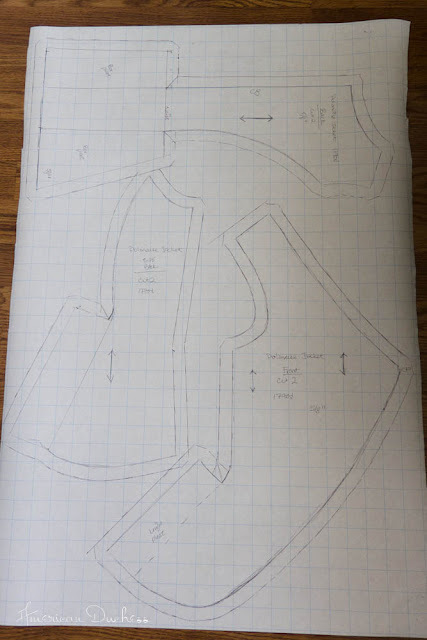 It was a hard pattern to drape, I won't lie - many nips and tucks were taken, then flattened out on the paper, when tracing out the pieces. I reserve judgement until I've made up a toile, to test my handiwork. My front drape. You can see at the waist where the fabric is tucked up - my hope is to keep that kind of tuck out of the finished garment, so it is all in one and smooth. The front piece laid out on the grid paper. The arrows drawn on the muslin, while draped on the form, are the grain lines. 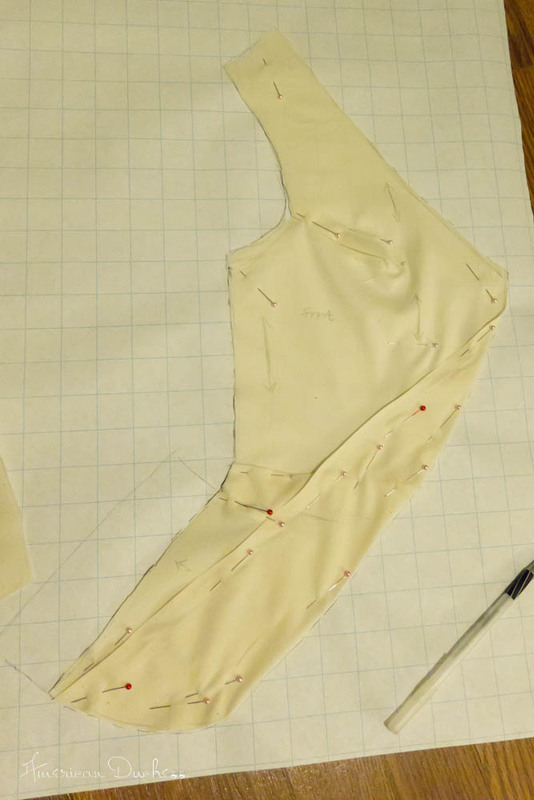 The tucks have been pressed as flatly as possible, before tracing around the pattern piece. The fabric I've found is an upholstery cotton with a sortof sateen-ish finish. There is a large brocaded floral motif every foot or so, which is a little further apart than I would have liked, but the overall look and weight of the fabric was just what I was seeking. It's going to be a challenge to piece the jacket together in a way that mimics the mirrored pattern-matching so exquisitely done on my inspiration jacket. My material, just draped up on the form to get an idea how it might look. While my textile is rather simple, I'm hoping to really go all out on the trim. The inspiration jacket has a very wide salmon-colored ribbon, possibly a silk grosgrain, pleated, over which is placed a beautiful, wide lace. I love the effect, and hope to do it justice with what I can find. Of course, when I'm all excited about sewing up a toile for this jacket, I'm about to leave for our costume cruise, so it'll have to wait. Ah well ... plenty of time to think over the "plan of attack." :-) Stay tuned! Oh lord, I'm now overly excited for this. Best of luck! 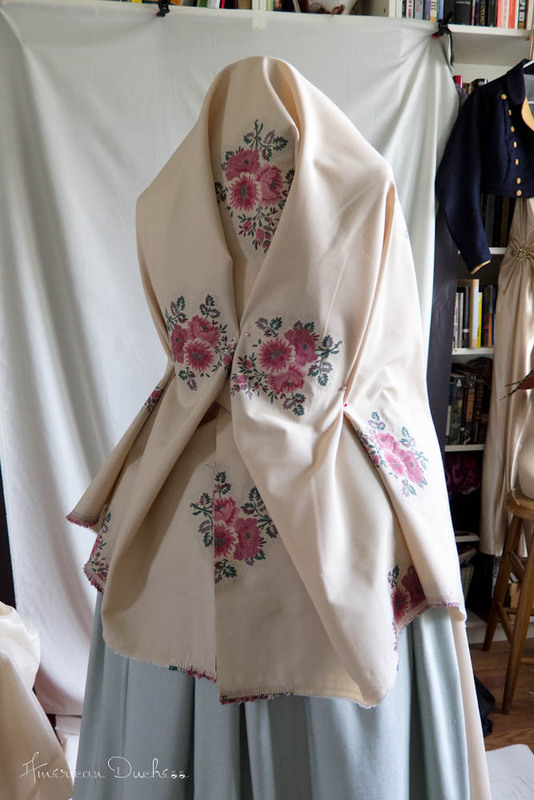 I am in love with the polonaise and the polonaise jacket, so I'm very excited to see how this project turns out. Have a good time on the cruise! I would love to make one of these. Although its part of fashion history, I think they would look so chic with jeans and a cami in the fall!! I was thinking the same thing as Brittany, this would be so awesome with the jeans and cami (and add in the 18th century shoes), or a pencil skirt. It reminds me of how we can add in elements of our favorite eras into our everyday modern wardrobes on those days when we can't walk around in full costume. What is the costume cruise? It sounds like a lot of fun. I think so too! Katherine (Koshka the Cat) had a Jacobean jacket she made that she wore with modern clothes and it looked fabulous. The costume cruise is a trip I'm going on with Lady Carolyn, who does chattaqua, an in-costume history presentations on cruise ships. I am her +1 for this cruise, from San Diego to Vancouver. this totally inspired me to get up and drape my jacket for this summer! That is going to be lovely! This is going to be so cute! I love the fabric! Best of luck on the new project! That is great fabric, wherever did you find it? The trim sounds wonderful, it's going to be a really lovely project! Thank you!!!! Thank You!!! THank you!!!! For letting everyone know the difference between Polonaise (verb) and Polonaise (noun). I don't know how many times I have to straighten people out about it. Drives me insane! lol. :D Great muslin BTW.